Once again the Guardians would be fighting rivals SFS for the top spot within KAIAC. 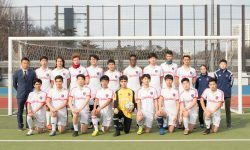 With only 3 losses on the season, the boys dominated their competition, only falling twice to SFS (who had gone undefeated for 5 years running) and one friendly match. Senior midfielder Ted Kim physically controlled much of the action in the middle and tough defender Arnold Chae led the team on the field. Along with the upcoming junior class of offensive powerhouse David Kim and aggressive defender Jamie Ha, it was a strong year for the Guardians. The Guardians completed the 08-09 season with another successful Far East run, easily winning the small schools tournament. The surprise of the tournament was freshman Daniel Cho, who came off the bench to score 7 goals throughout the 4 day event.